For the first tasting note from the Aleheads’ epic adventure in Philadelphia, I feel it’s appropriate to start out with something many of us had never experienced before. Granted, there’s plenty of beers on our sampling list that were new to most in attendance, but one beer stood out to me as something that was worthy of a post on a blog that few outside my own circle of friends and family reads. Very little introduction needs to be made on one of Belgium’s finest bottled ales, Duvel, but have you ever had Duvel on draft? Let’s take a peak and see what the little devil has to offer on tap. Duvel Green differs from the bottled version in that only a single-stage fermentation is employed. Your regular bottle of Duvel that you’ve been getting at package stores and bars for years undergoes a secondary fermentation at the brewery where the beer is conditioned in the bottle (Bottle conditioned, if you will), which results in a more complex brew with phenomenal amounts of carbonation. That little step of adding small amounts of yeast and sugar to the bottle is what gives Duvel, and many other fine Belgian brews, their distinctive awesomeness (I won’t elaborate further, I think awesomeness sums it up). 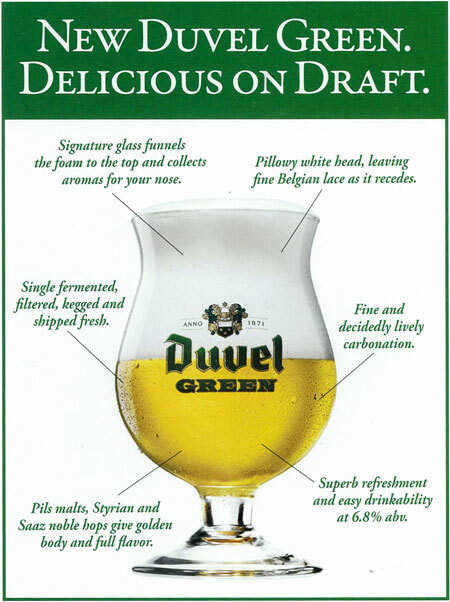 Duvel Green however goes immediately from the fermentation stage right into kegs or a small amount of bottles that are available close to the brewery. The official name for this beer is “Duvel Draft”, but when the brewery originally started offering this version in bottles they gave it a green label, hence the better known name of “Duvel Green”. The biggest difference between the two? 6.8% ABV for the Green compared with 8.5% for the original. Same brew, different finishes, way different results. Poured from, you guessed it, a shiny metal tap, my Duvel Green slid across the bar in its appropriate stubby tulip with 2 strong fingers of white lace. Much, much paler in color than the original it appears almost yellowish to clear. Without the head, and without the fact that I ordered this at Eulogy (My new favorite beer bar, thank you Philly), you may have thought you were peering through an American macro lager. Nose is much more floral than I’m used to from Duvel with undertones of sweet grass and straw. I got some lemon zest as the prize neared my lips and finally a touch of hops to finish things off. Very dry upon the first sip, which led into a symphony of tastes that mirrored the aroma magnificently. Very rare that you’ll come across an ale where the taste and smell match up almost flawlessly. That my friends is the very definition of refreshing. Quite light in body, the effervescence predominates and gives off a moderate to downright airy mouthfeel. This could possibly be the most drinkable Belgian Ale I’ve ever come across. Complex it is not, but that’s why an afternoon spent in front of a Duvel Green tap handle is a manageable affair. Overall score for the Duvel Green shows a 3 hop rating by my recollection. It gets top marks for taste and drinkability, but it lacks a depth of character that’s omnipresent in its more complex cousin. This beer is marketed perfectly for an American audience and could be a brilliant gateway to push your Bud swilling friends onto the finer things in life. I’m curious if Duvel Moortgat, who also owns Brewery Ommegang (Hennepin, Var Vos, et al. ), will bring out some other toned down versions in the near future. It’s tough to mess with a good thing, but in the case of Duvel Green, sometimes lightening things up pays off. Posted in Ale Factories, Tasting Notes.Tagged Belgian Golden Ale, Duvel, Duvel Draft, Duvel Green, Duvel Moortgat.